As I’ve learned more about food in the last five years, one thing that I’m happy to be incorporating more of in my kitchen is stem to root cooking. Many vegetables we eat are used only for their “end” product, like cauliflower, beets, watermelon, radishes, and celery. You may be surprised to know that each of these offers so much more that we can utilize instead of wasting. One such way is these colorful pickled swiss chard stems. Of course we love use to chard for its big leafy greens that are chock full of vitamins and minerals, but what about those beautifully vivid rainbow stems? According to several sources, the average American throws away 35 to 40 percent of the food they buy. I myself am not perfect either. There are definitely groceries or produce that I don’t get to before they need to be tossed, but I am making a conscious effort to change that. Last week I bought a huge bunch of rainbow Swiss chard, and after braising the nourishing leaves in coconut milk as part of a curry dish, I was determined to save the stems from the garbage and turn them into something delicious. The end result? 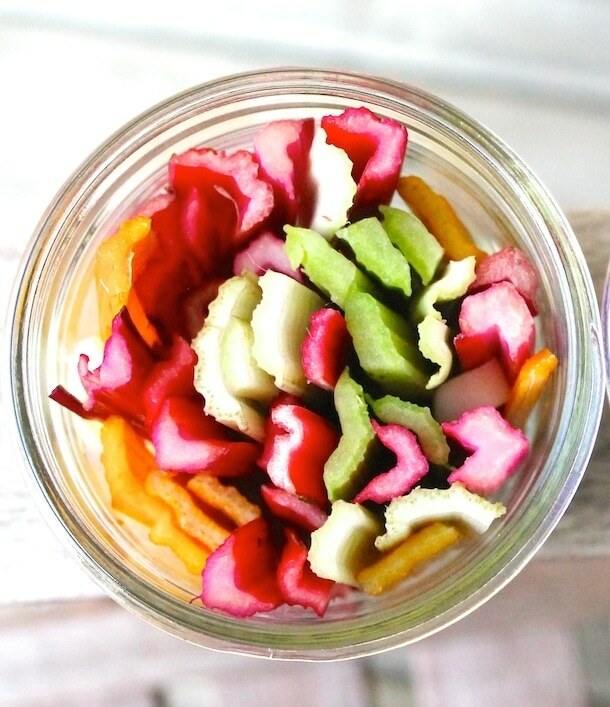 These tart and snappy pickled chard stems! I thought about roasting them, but I really wanted to preserve their stunning neon colors. This recipe is easy and requires only a few ingredients. It’s also nice because no water bath canning is involved, just a hot seasoned brine and a few days in the refrigerator for the flavors to develop. A combination of garlic, peppercorns, mustard seeds and sriracha spice things up to create this zesty pickle. They’re a perfect snack on their own, diced on top of pork carnitas, or chopped into an omelet. Add each half of the celery seed, peppercorns, mustard seeds, and garlic to each jar. (If just making one jar, this can all go together.) Pack chard stems tightly into jars. Bring vinegars, sugar (or maple syrup), salt, and sriracha to a boil, in a small saucepan until sugar and salt is dissolved. Then pour over chard stems. Let sit until cool, then put lids on and refrigerate. Wait two days before eating for flavors fully develop. Will last 1 month in refrigerator. 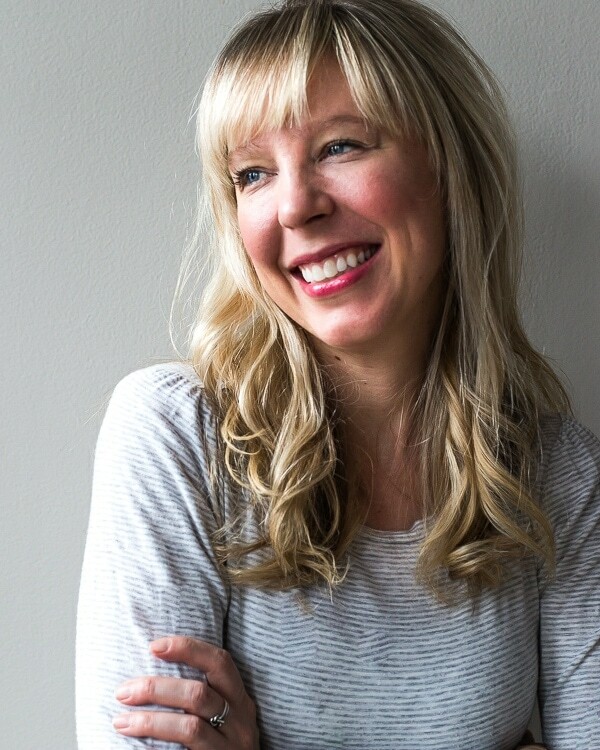 *And a little news – I’m excited to be writing and creating recipes for Mother Earth Living magazine’s blog. With values and content that aligns directly with my philosophy on what encompasses a healthy lifestyle, the partnership was a perfect fit. I love that they include all parts of a what a healthy home and lifestyle entails, not just the food you eat or your exercise habits. You’ll find great ideas like how to make your own lavender hand cream, minimizing your footprint, gardening, and food preservation like these spicy pickled chard stems. Awesome, Amanda! The colors of these stems are gorgeous. Bookmarked. separated stems from greens- chop greens coarsely and set aside. Chop stems into small sliced across the veins, ( little crescent shapes) . Chop 1/2 an onion. Add 2 Tbl favorite oil to large saute pan. Add onion and Swiss Chard stems. Saute till onion starts to get translucent (few minutes) add chopped greens, stirring till they start to wilt and get soft. Splash with 2 Tbls red wine vinegar or spiced vinegar. stir, remove from heat and serve. Salt as desired. You will never even think about throwing away the stems. They really are the best part. Yummy. Thanks Moriah, I’m glad you liked it! I’m going to try this with stems from beet greens! I think that this could make great pickled beet stems! Let me know how they turn out. This was SUCH a hit at our buddy’s 30th birthday cookout this past weekend. We were all doing “pickle backs” with the leftover juice once the chard was gone — MMM! A must try. Making another batch tonight to give to my food-lovin’ stepfather. Thank you, thank you, thank you! I am trying to use items I have already; can I use mustard power, apple cider vinegar, and garlic powder instead of the forms listed above? Also, what, if anything, can substitute for sriracha and peppercorns? I am already fermenting beetroot & using the tops for salads, and I would like to do something with the stems, but I don’t want to buy something I won’t use again. Thanks for you help. Hi Gloria! Apple cider vinegar will work, using dry spices will make it cloudy though. But if you’re not worried about that, the taste will still be good :) You could use 1/4 teaspoon of red pepper flakes for the sriracha and leave out the peppercorns. Could it be hot water canned? I have so much I would like to make it and give as gifts!? Did you process some. I too have to much to eat by myself. Did you use water bath. hello! yes, you can process in a boiling water bath for 10 minutes. 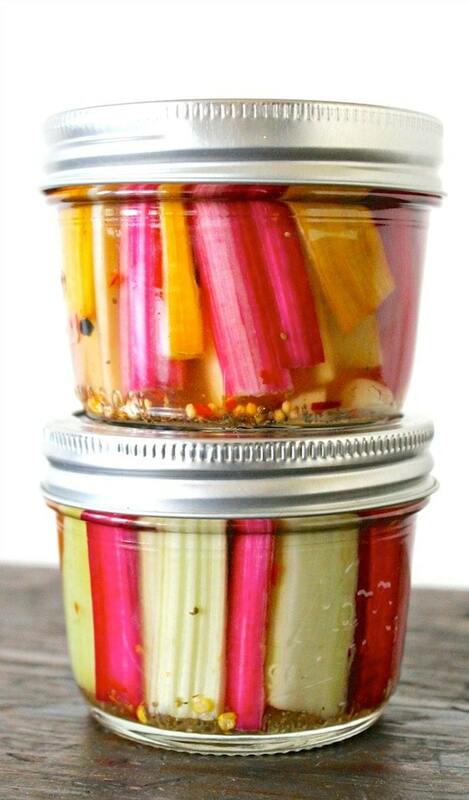 Can pickled chard stems be processed to keep some for over winter? I would think they could, but have not experimented with this recipe. I am allergic to some of the ‘stuff’ in sriracha. Can I use a jalapeno chopped fine?